Bob Gaughan recaps the college football weekend, with a slant towards the top quarterback prospects and what matters to fans in Buffalo. 22 scouts from 16 NFL teams were on hand to watch the Luke Falk-Sam Darnold duel. Washington State took advantage of a beat up USC team and came away with a 30-27 victory. Luke Falk was excellent throwing for 340 yards and two touchdowns. He even had some dropped passes that could have made the numbers even better. Falk made the USC defense look average and showed why there are concerns in the Trojans secondary. USC was down three starters on the offensive line, which led to Sam Darnold being pressured all night long. He was only sacked once but the pressure seemed to rattle him. Darnold did rush for two touchdowns. He had one interception, which brings him up to 8 in five games. He threw for a career low 164 yards on the night. He fumbled under pressure while having a chance to lead the Trojans down the field for the tie. USC wasted good field position a few times as well. Overall it was just a bad night for the Trojans and the guy most consider to be the number one pick in the draft Sam Darnold. UCLA beat a very tough Colorado team 27-23 late Saturday. 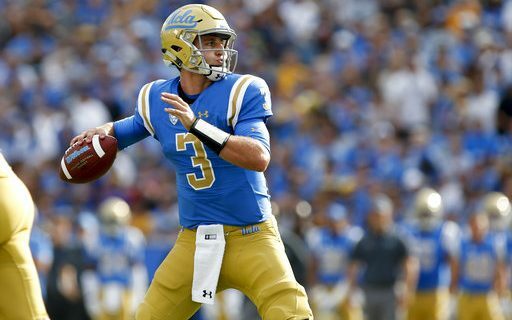 Josh Rosen was 28-45 for 372 yards and a touchdown. This was Rosen’s fifth straight 350-yard game. As is typical of Rosen he always has one what were you thinking throw. He threw an ill-advised pass into double coverage that got picked off and set up a Colorado field goal. In the first quarter Mason Rudolph threw an 85-yard pick six that tied the score at seven. Rudolph rebounded with a solid performance to lead the Cowboys to victory. Rudolph led the Cowboys inside the redzone in 11 of 12 possessions. He finished with 376 passing yards and three passing touchdowns. His rushing TD in the final two minutes gave Oklahoma State a 41-34 win over Texas Tech. Oklahoma State missed two chip shot field goals in the game. They should have won by double digits. Clemson went in a usual tough place to play in Blacksburg Virginia and dominated the Hokies to come away with a 31-17 win. Show you how good Clemson is, Auburn’s eight point loss earlier in the season is looking more and more impressive. WR and pro prospect Deion Cain ran away from VA Tech CB Brandon Facyson. Facyson’s stock clearly went down because he looked flat footed when trying to catch Cain. The Clemson defensive line that includes prospects DE Clein Ferrell, DT Christian Wilkens and DE Austin Bryant continues to dominate games. Two Heisman hopeful RB’s had big days. Stanford’s Bryce Love joined Barry Sanders and Ricky Williams by going over 1,000 yards rushing in just his fifth game. Love had 301 yards rushing in the Cardinal’s 10-point win over Arizona State. Saquon Barkley is the favorite for the Heisman. He did nothing to lose votes in PSU’s 45-14 win over Indiana. He returned the opening kick-off 98 yards and then combined for 107 yards rushing and receiving on the day. Speaking of RB’s Emmanuel Reed ran for 144 yards and three first half touchdowns to lead UB to a 27-13 win over Kent State. QB Drew Anderson filling in for the injured Tyree Jackson was efficient combining for 222 yards on the day passing and receiving and one touchdown. The Bulls sealed the win early in the third quarter-with a goal-line stand as Kent tried to tie the score. The Bulls then went on a 99- yard drive capped off by a Anderson to Zac Lefebvre 5 yard pass. The Bulls have now won three straight and are 3-2 on the season and 1-0 in MAC play. UB returns home next week for a 3:30pm contest against Western Michigan. Tennessee’s Butch Jones had an awkward press conference after a win last week. Can’t imagine how this week will go after losing to Georgia 41-0 at home. It was the worst home loss for Tennessee in over 100 years. Not to be out done Ed Orgeron’s LSU squad, coming off an embarrassing loss to Mississippi State, dropped a 24-21 decision to Troy for homecoming. Troy led 17-0 and 24-7 before two late Tiger scores made the score respectable. By the end of the game the 102,000 seat Tiger stadium was mostly empty. The Bills may be looking for DT in next year’s draft. Alabama’s Da’Shawn Hand a very good DT that can take on two blockers and hold his ground was carted off the field with a knee injury. Kyle Williams may retire and who knows what the Bills think of Marcell Dareus. This is an injury that could mess with a prospect the Bills were seriously looking at in next year’s draft.